GUYON, LOUISE (Thibault; Damours de Freneuse), baptized 1 May 1668 on Île d’Orléans, daughter of Simon Guyon and Louise Racine; d. sometime after 1711. Louise Guyon lost her parents when she was young, and married her first husband, Charles Thibault, at Château-Richer on 10 April 1684. He died 17 months later, and on 1 Oct. 1686, at Quebec, she married Mathieu Damours* de Freneuse; at the same time her older sister, Marguerite, married Louis Damours* de Chauffours, Mathieu’s brother. Louise’s marriage introduced her into one of the first families of Canada; her father-in-law Mathieu Damours* de Chauffours, was a councillor of the Conseil Souverain, and four of the sons owned seigneuries in Acadia. Mathieu, Louise’s husband, had obtained two leagues of land on the Saint John River between Jemseg and Naxouat (Nashwaak, N.B.). The couple settled there in 1686, and for ten years attended to developing their domain. The 1695 census informs us that they owned 30 acres of land under cultivation, as well as a herd of livestock and that they harvested 200 bushels of grain. They also engaged in the fur trade with the Indians. 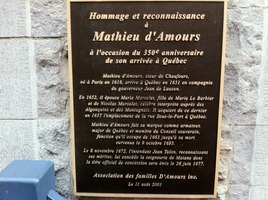 In 1696 Mathieu Damours went to Quebec to replace his father, who had died the previous year, on the Conseil Souverain. Intending to settle in the capital, he rented out his seigneury and went back to get his wife and five children; he died before he could return to Quebec. 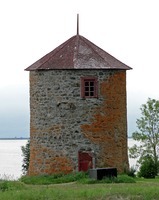 Mme Damours de Freneuse remained for a few years on the Saint John River, trying to put her finances in order. An order from the king granted the office which her husband had held on the Conseil Souverain to the Sieur Denis Riverin* on the condition that he pay 1,000 livres to the family. In 1700 the seat of the government of Acadia was transferred to Port-Royal (Annapolis Royal, N.S. ), and Fort Saint-Joseph (Naxouat), where Governor Joseph Robinau* de Villebon resided, was demolished. As its inhabitants were left without defence, they moved to Port-Royal; Mme de Freneuse went to live there around 1702 with her sister and brother-in-law Louis Damours de Chauffours. The new governor, Jacques-François de Monbeton* de Brouillan, and the officers welcomed warmly this young widow of 34 years of age, mother of five children, and took into the garrison her three oldest sons, whose ages varied from 10 to 15 years. Simon-Pierre Denys* de Bonaventure, the king’s lieutenant, extended the courtesy to the point of sheltering her in his home until she acquired a house not far from the fort. M. de Bonaventure probably went a little beyond the bounds of gallantry, for a child was born the following year who was named Antoine and whose baptism, which took place on 6 Nov. 1703, appears in the parish records of Port-Royal. From then on this liaison kept tongues wagging at Port-Royal and took on the dimensions of an affair of state in official correspondence. The lieutenant general for justice in Acadia, Mathieu de Goutin*, along with the missionaries Félix Pain and Patrice René, denounced the scandal. Bishop Saint-Vallier [La Croix*] of Quebec asked that the woman be sent away, and Pontchartrain, the minister of Marine, ordered her to be sent to Canada or to the Saint John River. But Bonaventure put up a vigorous defence, affirming that simple charity had guided his conduct. He demanded an inquiry and, in a chivalrous gesture, offered to leave himself rather than see exiled this unfortunate woman, who, in addition to keeping her five children, had just taken in two orphaned nieces. Brouillan, the governor, also took up Mme de Freneuse’s defence and was satisfied with removing her temporarily from Port-Royal. Thereupon Brouillan died, in September 1705, and Bonaventure took over his duties temporarily while waiting to become governor in name – it was an office he greatly desired. Probably in order not to hinder this promotion, Mme de Freneuse left for La Rochelle, France. But on 22 May 1706 the court named Daniel d’Auger* de Subercase governor, and the minister told Bonaventure flatly that the scandal he had caused had prevented the king from appointing him. His virtuous majesty could indeed keep mistresses, but did not stand for them among his officers. Mme de Freneuse returned to Port-Royal. A new storm now broke; this time it was victims of Bonaventure’s authority who complained of him. Despite the minister’s orders Subercase temporized and contented himself with sending the lady off to the upper part of the Rivière Dauphin (Annapolis River). 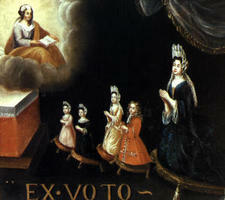 In 1707, after changing her mind several times, Bonaventure’s legal wife, Jeanne Jannière, finally came to live in Acadia. There ensued temporarily a period of calm, but the lovers still saw each other. 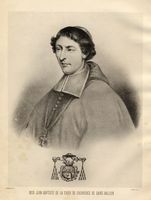 Goutin continued sending his dispatches to the court, the bishop of Quebec returned to the charge, and Father Patrice René went to France to complain to the minister. Upon learning that he had not yet been obeyed, the minister became angry: he blamed Subercase, giving him a formal order from the king to send Mme de Freneuse away, and told Bonaventure that if by the time the ships departed she had not left, he would be cashiered and deprived of his post. Subercase complied with the order and Mme de Freneuse left for Quebec in the summer of 1708 escorted by Charles-Joseph Amiot* de Vincelotte. In 1710 Bonaventure returned to France after the British capture of Port-Royal and he died at Rochefort in 1711. In the course of that year Mme de Freneuse returned to Port-Royal (renamed Annapolis Royal) with a pass from Philippe de Rigaud* de Vaudreuil, the governor of New France. She crossed the Baie Française (Bay of Fundy) in a canoe in the heart of winter, alone with her youngest son and an Indian. The acting English governor of Annapolis Royal, Sir Charles Hobby*, allowed her to stay there, but Paul Mascarene claimed that she was acting as a spy for the French government. Certainly Mme de Freneuse would have had several valid reasons for returning to Acadia, if only because of the many relatives she had there and to see to the possessions she had had to leave in haste behind her at the Saint John River and at Annapolis Royal. On the other hand, we know that the court of France was seriously thinking of retaking Annapolis Royal. 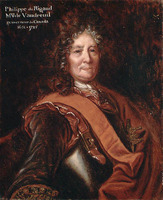 Already Denys de Bonaventure had drawn up at Rochefort a detailed plan to this end, and it is possible that Mme de Freneuse collaborated in this plan by supplying Vaudreuil with information on the English forces at Annapolis Royal. According to Mascarene, two of her sons may have taken part in June 1711 in the attack at Bloody Creek (near Bridgetown, N.S. ), where 30 English soldiers perished. They are then supposed to have returned to Annapolis Royal to conduct their mother to a safe place. After that Mme de Freneuse drops from sight. She must have lived some time at Quebec, then have gone back to France, for we find some of her children living at La Rochelle in 1727; two of her sons had naval careers. An American novelist has written a questionable novel about Mme de Freneuse. What need is there of adding imaginary episodes to the ardent and courageous life of this woman, the heroine of a true romance filled with adventure and passion? AN, Col., B, 15, f.69; 20, f.80v; 23–33; C11A, 29; C11D, 4–6; 7, ff.100ff. ; Section Outre-Mer, G1, 466, pièces 10, 17, 20, 22, 24 (recensements de l’Acadie). “Correspondance de Vaudreuil,” APQ Rapport, 1939–40, 427. Archange Godbout et R.-J. Auger, “Familles venues de La Rochelle en Canada,” ANQ Rapport, 1970, 193, 206. Jug. et délib., III, 436; IV, 43. J. C. Webster, Acadia at the end of the seventeenth century: letters, journals and memoirs of Joseph Robineau de Villebon, commandant in Acadia, 1690–1700, and other contemporary documents (N. B. Museum, Monographic ser., I, Saint John, N.B., 1934). Tanguay, Dictionnaire, I, 294, 565. E. S. M. Eaton, Quietly my captain waits (New York, London, 1940). Murdoch, History of Nova-Scotia, I, 268, 302. W. O. Raymond, Glimpses of the past; history of the River St. John, A.D. 1604–1784 (St John, N.B., 1905), 73–74. Pierre Daviault, “Mme de Freneuse et M. de Bonaventure,” RSCT, 3rd ser., XXXV (1941), sect.i, 37–56. W. F. Ganong, “Lease of the seigniory of Freneuse on the St. John in 1696,” Acadiensis ([Saint John, N.B. ]), I (1901), 121–25. P.-G. Roy, “Mathieu Damours de Chauffours,” Les petites choses de notre histoire (7 sér., Lévis, Québec, 1919–44), 6e sér., 68–78; “Mathieu Damours de Freneuse,” BRH, XXXII (1926), 577–82. René Baudry, “GUYON, LOUISE,” in Dictionary of Canadian Biography, vol. 3, University of Toronto/Université Laval, 2003–, accessed April 20, 2019, http://www.biographi.ca/en/bio/guyon_louise_3E.html.